Amal Aun is a Palestinian Fulbright Scholar from Israel. A second-year CIPA student, she is concentrating her studies on Human Rights and Social Justice, with a special emphasis on the Middle East. During the Fall of 2017, I was part of a Capstone team that worked with a volunteer-based organization called Humanity Crew (HC). It provides psychosocial support to Syrian refugees in refugee camps on the Greek island of Lesvos and beyond. During the semester, we conducted extensive research on the importance of Mental Health and Psychosocial Support (MHPSS) to the overall well-being of refugees. For the past three years, Humanity Crew has attempted to shed light on the importance of prioritizing mental health while dealing with the global refugee crisis. They have cooperated with international organizations on providing culturally- and linguistically-sensitive treatment for Syrian, Palestinian, and Iraqi refugees, and continue to advocate for it with other organizations. Humanity Crew sought CIPA’s support to expand their research and publications on the issue and advance their efforts in providing more efficient and effective MHPSS for refugees. As a result, we comprised a report on current MHPSS services provided specifically in Greece along with our informed recommendations as to adjust and reform existing practices to meet their goals. Our research relied heavily on interviews, existing guidelines, and academic publications on mental health provision in refugee settings. After the semester ended, we traveled to Greece to complement our academic research with field work and document the mental health practices taking place as well as the challenges facing the practitioners and the refugees. On the trip, we spent four days conducting interviews with local and international organizations provide mental health to the resettled communities in Athens. We met with organizations that house the refugees and provides in-house individual treatment, and others that provide specialized support to women and children. We then moved to Lesvos -the closest Greek island to the Turkish border- to continue our research in the refugee camps as the first point of entry. Millions of people have been forced to flee their homes for neighboring countries, searching for safety. In Greece, millions of people are still held in refugee camps waiting for their asylum status to be processed. The camps are overpopulated. Ten to sixteen people are sleeping in six-person tents in the cold without running water or heat. 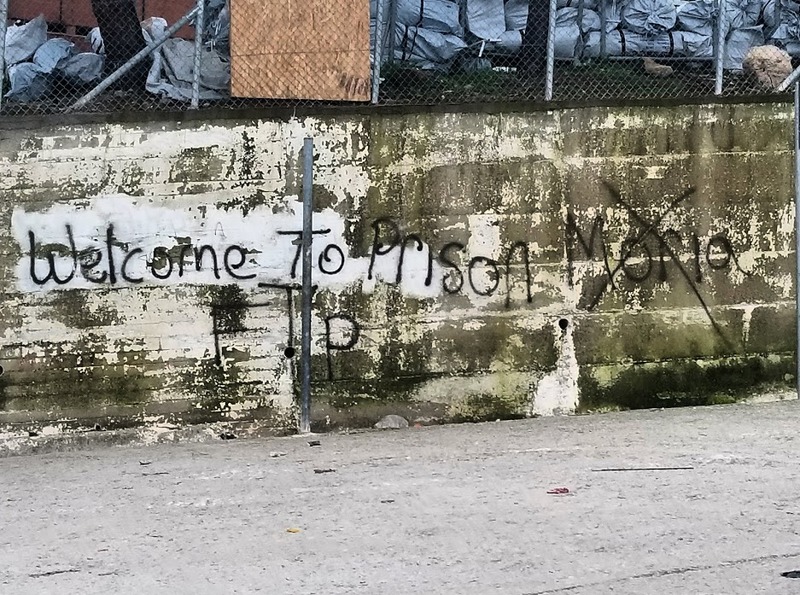 A lot of the people there report that, while they did experience trauma getting to the island from their home countries, the living conditions in the camps – with no basic needs met- are causing depression and more long-term psychological issues. Social workers and professionals confirm these experiences. Professionals share that while mental health should be a priority, officials there are overworked and overwhelmed. Many times people wait two and three months after their arrival before speaking to a mental health specialist about their experiences. On one of the last days of the research trip, the team and I went to Moria Refugee camp. 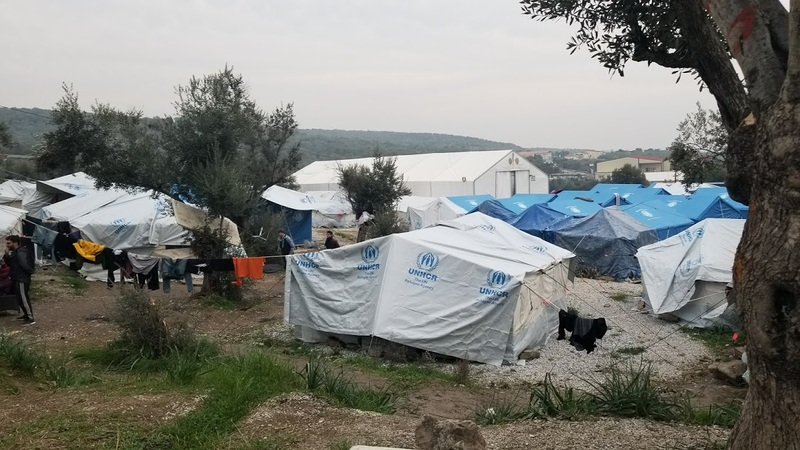 This camp is documented to be one of the harshest in Greece in terms of living conditions, population, and government treatment. 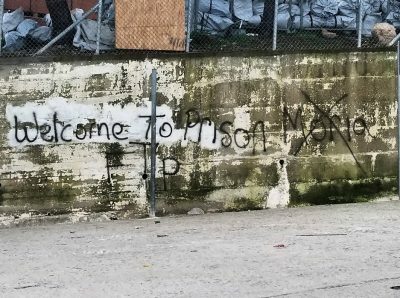 When we arrived there, the first thing we saw as we walked into the general space just outside the camp borders was graffiti saying “Welcome to Moria” with Moria scratched out and replace with the word PRISON. At Moria we were scheduled to volunteer with International Red Cross staff for the day and participate in their psychosocial activities for the refugees, which included board games, backgammon, and a movie screening. We met with two staff members: Qassem and Ali. Qassem is an Afghani refugee himself and he shared how he was in this same camp two years ago waiting for his papers to be processed. 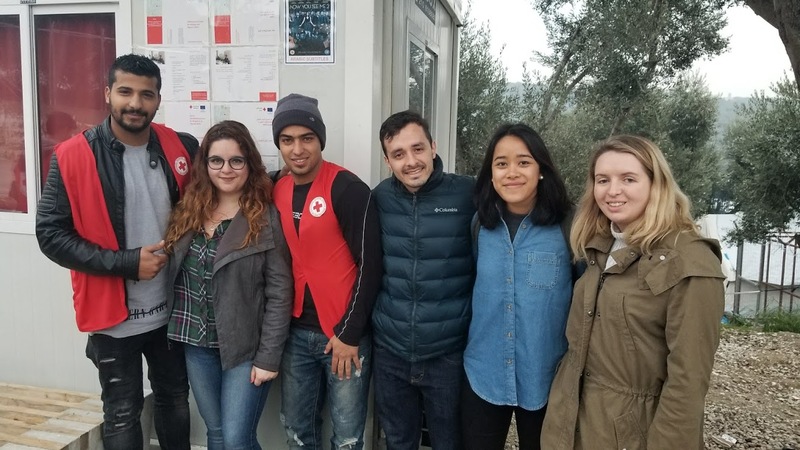 The minute he was able to legally stay in Greece and work, he came back to the Red Cross and started working with them in their social activities section. Qassem told us about his dreams and career plans, explaining that he had attended university in Afghanistan and completed a degree with a double major in computer science and English. He wanted to continue his education in the new country. CIPA fellows with refugees and Red Cross volunteers in Moria camp during the weekly afternoon activities. Left to right: Ali, Amal Aun, Qassem, Daniel De La Hormaza, Ranissa Adityavarman, and Molly Warrington. We then talked to Ali. Ali is a Palestinian-Syrian. His family sought refuge during the Israeli-Palestinian war and fled to Syria. He was born in a Palestinian refugee camp in Syria and lived his entire life there. His mom and dad were born in the village next to mine. When he heard me speak, his eyes watered. He smiled and said “How wonderful to hear someone speak in my family’s accent.” In Syria, Ali got his B.A in accounting and worked for a prestigious company as their accountant. He told us how he was happy and satisfied until the Assad regime killed his brothers. They then came to recruit him to that same army that murdered his brothers. That is when Ali decided to flee. Looking at Ali, one would think that he just came to the camp from his private apartment in downtown. He looked fashionable, well rested, and overall comfortable. While talking to us, he points at tent number 6, right next to us on the ground where over 500 men are staying, and says “This is where I live.” There was something about that that made all of our jaws drop. In our minds, it seems, we expected that someone as educated, empowered, and seemingly resourceful to have just opportunities presented to him. In our minds we thought that this is how life should be. Seeing Ali, however, was both happy and sad. I was happy talking to him because he taught me that humans are resilient and adaptable. No matter what happens to us, we always find a way to not only help ourselves, but also help others. He taught me that our happiness is inherently derived from the total happiness of all; and whenever we can, we should be there to support others. Ali leveraged his interpersonal skills and English language knowledge to volunteer with the Red Cross to serve the community of which he is a part. Note: In Mid-March, we were happily informed that Humanity Crew presented our own CIPA report to the Sub-Commission on Human Rights at the European Union. There, the Co-Founder of the organization, Maria Jammal, talked about the grave situation of refugees in Greece and beyond, and the importance of specifically tailoring mental health services to the different cultures, among other things. It is a true honor to know that the work we do here at CIPA provides a great value and impact to the world as we speak, and actively advances the human rights of the people who need it most.